Race week in Kona has officially arrived. The buzz around Dig Me beach in Kailua is pretty infectious and Ali'i Drive is a lycra, visor and compression wearing scene. There are fit people everywhere, and you don't have to look to hard to find the pros amongst them. It has been a fun week so far, though the reality that I'm going to have to race in 5 days really kicked in when I picked up my bib today. Since arriving on Saturday, the days have been slipping by rather quickly! It has been busy - I've run Ali'i Drive a few times (including a charity 10k race on Sunday), rode a few sections of the course and enjoyed a couple swims. Every Ironman swim should be as scenic as the one here! The water is clear, there are lots of colorful fish (humuhumunukunukuapua'a!) and you can see the bottom the entire way. Who knew that I would LIKE the swim part! It's not all a proverbial walk on the beach though. It's hot, humid and windy. The crosswinds at Hawi did not disappoint on a training ride yesterday - things could get interesting on race day if the winds are that strong. The wheel change was definitely a good thing as we were at the mercy of a solid 30kph wind with gusts that were probably 50-60kph. The person that recommended taking in lots of nutrition before hitting that section of the bike course was a wise, wise person. Aside from the last few training sessions, we've also been participating in the requisite Kona race week activities - coffee and brunch at Lava Java this morning, hitting the booths along Ali'i Drive for samples, and on Thursday the Kona undie run! It was like being in a candy store running along Ali'i this morning - bag check in at the King Kam, stops for Nuun, Cytomax and Perform along the way and lots of freebie recovery drink at the end. Every training run should be like this! Most of all, it is an honor to be here to take it all in and very humbling to be beside so many accomplished athletes. Getting to Kona is one thing - being fast here means something entirely different indeed and I am totally out of my league. 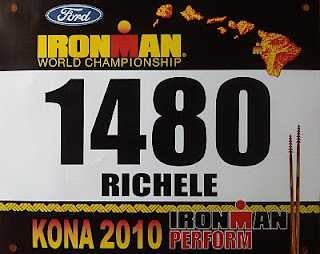 My focus will be on trying to have fun and trying to finish - it's pretty unreal that I am going to have the opportunity to race Kona, with all its lore and infamy. Here's hoping Madame Pele wants me on her team on Saturday!